Can Looking at Photos of Trans People Reduce Prejudice? One of the more interesting and important ideas in social psychology is the “mere exposure effect.” The basic idea is that simply being familiar with a person or type of person is likely to make you feel more warmly toward them, and this notion is part of the broader “contact hypothesis,” as it’s called, which posits that the more groups of different people interact (peacefully), the less conflict and the more understanding there will be between them. Now, obviously prejudice and intergroup relations are more complicated than that — plenty of people are prejudiced against groups they also interact with. But for decades, a cohort of social psychologists has been trying to probe the features of these ideas, hoping to better understand which types of exposure and contact can best improve human relations. The latest such research has to do with transgender rights, and it comes in the journal Political Psychology. 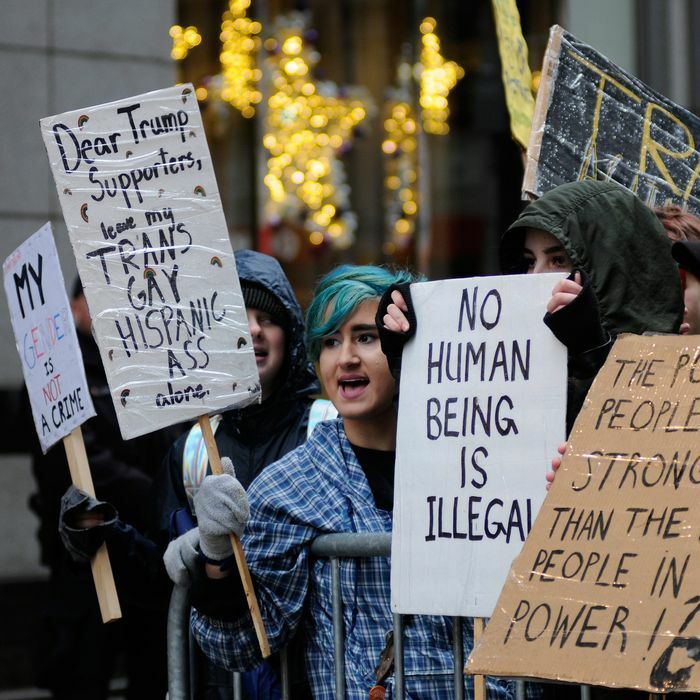 For a study published there, a team led by Andrew R. Flores of Mills College ran an online experiment in which they evaluated whether a short intervention could increase respondents’ reported tolerance of transgender people. Every attempt to foster contact or exposure must grapple with different stereotypes, and in this case Flores and his colleagues were interested in the extent to which discrimination against trans people stems from the fact that sometimes they appear to violate societally embedded gender norms. So that was one of the primary focuses of this study. Overall, showing an image — putting a face to the vignette, basically — was correlated with reduced discomfort toward trans people, and it didn’t matter which sort of image was shown: The average score for discomfort with trans people was significantly lower among those who saw an image as compared to those who didn’t, whether they were in the control group or the no-image vignette group. The news was more mixed elsewhere: Those in the treatment groups who saw gender-incongruent images or no image at all reported significantly less transphobia than those in the control group, but there was no significant difference between the levels of transphobia reported by those in the gender-congruent group versus the control group. Nor did the treatments have any effect on attitudes toward transgender rights. Moreover, the researchers didn’t find that the intervention was all that effective even when it did work: “The effect sizes range from 0.09 to 0.13 among treatment effects that were statistically significant.” If you go here, use the slider to set the value to 0.1, and look at the amount of space between the two dashed lines, you’ll see that this translates to a very small difference between the treatment and control groups. Finally, the respondents’ politics seemed to be a mediating factor: self-reported Republicans, who are generally less favorable of trans people and trans rights, were usually unmoved by the intervention at all, while it did tend to have an effect on Democrats. Overall, there just isn’t all that much here. There’s nothing wrong with that, of course — this still helps us better understand the hows and whys of discrimination — but it’s just hard to get excited about such small and inconsistent effect sizes. Now, this is an online study in a very contrived setting, so it can’t speak to the effects of more in-depth anti-prejudice interventions. A year ago, for example, Science of Us covered a very promising-looking one involving canvassing — one which is, it should be said, much more time- and resource-intensive than an online intervention like this one. There’s still a huge amount social psychologists don’t understand about prejudice and discrimination. And when it comes to transgender people, who constitute a relatively novel social category for many Americans, there are even more questions. Studies like this can help us chip away at those questions, even when the results are a bit underwhelming. If anything, the norm should be to acknowledge limited findings, since they are simply part of the scientific process. Can Looking at Photos of Trans People Help Reduce Prejudice?